Have you taken a business class including DIT, ITF, or Econ/Personal Finance? If so then you are eligible to join an exciting new club at Lafayette. FBLA is an organization for students interested in business, management, economics, and accounting. We will be holding an informational meeting today after school in room 118 from 2:30 – 3:15. Come join the fun, compete in business competitions, learn about scholarships & leadership and see what FBLA is all about. Attention athletes and students staying afterschool, the school store will now be open every day afterschool from 2:20 – 2:40. Come by and refuel before your event with a quick snack or refreshing drink. Seniors – your last chance to get your senior portrait taken and be in the yearbook is here! Lifetouch will be here at Lafayette on Tuesday, October 14th from 8:00am until 3:00pm. Sign-up for your time on the bulletin board just outside of the media center. There is a $20.00 sitting fee. If you do not get your picture taken on this day you will have to travel to the Chesapeake studio to have it done. If you are interested in joining the National Art Honor Society, please pick up an application in room 103. Students today begins our fall SOL Writing tutoring from 2:25 – 4:00 in room 113A with Ms. Fisher. Writing tutoring will be every Tuesday and Wednesday until the end of October. If you are not able to attend, please see Mrs. Colorado. Sophomores vote in the class election. https://wjccschools.org/lhs/wp-content/uploads/sites/20/2014/09/Soph-vote-5-fix.jpg 375 665 Monica Schauffler https://wjccschools.org/lhs/wp-content/uploads/sites/20/2017/10/Lafayette-High-School.png Monica Schauffler2014-09-29 13:49:162014-09-29 13:51:00Sophomores vote in the class election. https://wjccschools.org/lhs/wp-content/uploads/sites/20/2014/09/Soph-vote3-fix1.jpg 375 665 Monica Schauffler https://wjccschools.org/lhs/wp-content/uploads/sites/20/2017/10/Lafayette-High-School.png Monica Schauffler2014-09-29 13:48:142014-09-29 13:50:38Sophomores vote in the class election. 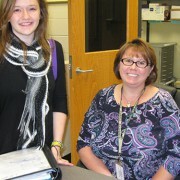 Mrs. Plank, Lafayette’s new ITRT, assists a student. https://wjccschools.org/lhs/wp-content/uploads/sites/20/2014/09/New-ITRT-fix.jpg 375 665 Monica Schauffler https://wjccschools.org/lhs/wp-content/uploads/sites/20/2017/10/Lafayette-High-School.png Monica Schauffler2014-09-29 13:44:312014-09-29 13:45:14Mrs. Plank, Lafayette's new ITRT, assists a student. T James-City County Police Department’s Explorers Program is a law enforcement organization whose main purpose is to give young adults a chance to begin training themselves for a career in the field of Law Enforcement. The first meeting will take place on Tuesday, October 7th at James-City County Police Headquarters, located at 4600 Opportunity Way from 5:30 â 6:30. Please see our SRO â Officer McLaughlin for requirements and/or question about this program. Attention Lafayette – do you want to win more arguments with parents, friends and teachers? Do you want to stand your ground and get your point across? Do you want to build your resume and earn college scholarships? Do you want to be part of a VHSL academic team? Then come to the 1st Debate Team meeting next week on Tuesday, September 30th in the Black Box Theatre room 623 after school from 2:30-3:30. Snacks and drinks will be provided. See Mrs. McCorry in room 623 for any questions. Have you taken a business class including DIT, ITF, or Econ/Personal Finance? If so then you are eligible to join an exciting new club at Lafayette. FBLA is an organization for students interested in business, management, economics, and accounting. We will be holding an informational meeting on Tuesday September 30th afterschool in Room 118 from 2:30 to 3:15. Come join the fun, compete in business competitions, learn about scholarships & leadership and see what FBLA is all about. Attention athletes and students staying afterschool, the school store will now be open every day afterschool from 2:20-2:40. Come by and refuel before your event with a quick snack or refreshing drink. Seniors – your last chance to get your senior portraits taken and be in the yearbook is here! Lifetouch will be here at Lafayette on Tuesday, October 14th from 8:00am until 3:00pm. Sign-up for your time on the bulletin board just outside of the media center. There is a $20.00 sitting fee. If you do not get your picture taken on this day you will have to travel to the Chesapeake studio to have it done. 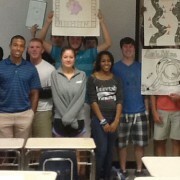 Mrs. Hanks’ Probability and Statistics class have fun playing the games they created involving probability. All students interested in wrestling this year please plan to attend a meeting at 2:45 today in the Wrestling Room. If you cannot attend, please see Coach Wortman in Room 114. There is going to be a DECA informational meeting on Tuesday, September 23 in room 118 from 2:30 â 3:15 for anyone who is interested please stop by. There will be snacks and you can learn what DECA is really about. Attention students: The Library now has Kindles that you can check out and take home. Each Kindle comes with 14 eBooks downloaded on it, and we have over one hundred more titles to choose from! Please visit the library for more information. Applications to join the Spanish Honor Society are due to Sra. Marzana by the end of the school day today. Gracias. Attention Students: If you are interested in running for class office, please pick up an application today or Friday from the main office or from Mrs. Hopkins in F-5. Applications are due to Mrs. Hopkins on Monday, September 22nd by the end of the day. Please see a SCA officer if you have a questions. Come out and join the Lafayette Theatre department on Friday, Sept. 19th at the Great American Cookie, located on Main Street in Newtown, between the hours of 5pm-10pm. We are hosting a fundraiser for our spring musical and we want you to come by and say, âI support LHS Theatreâ and buy a cookie or two. We will also give out the first clue of what the spring musical title will be. Forensics is not about blood or CSIâ¦come out on Thursday, Sept. 25th to find out all about joining the LHS Forensics team. New Members are encouraged to come out and learn more about this fun and exciting academic sport that features 10 different categories to participate in. This is a sport that you can letter in â and is part of VHSL academic sports. Current team members our first meeting is Thursday, Oct. 2nd. All members are required to sign up for your category at our next meeting on Thursday, Sept. 25th. Past team members will be given a ânew student’ to sponsor and mentor on the 2014-2015 team. Open to all studentsâ¦see you at the next Forensics meeting on Thursday, Sept. 19th from 2:30- 3:15 in the Black Box Theatre-room # 623. We will have our first Operation Smile meeting on Tuesday, Sept. 23rd in the Black Box Theatre -room # 623 from 2:30 â 3:00 pm. All students are encouraged to find out all about Operation Smile come out and how you can make a difference! Dues are $20, which includes an Operation Smile tee shirt. Any questions see Mrs. McCorry room #623. Seniors! It is that time of year. College Representatives will be visiting Lafayette. This month VCU, Virginia Tech, Bridgewater College, Colgate University, and Sacred Heart University. Check the blue binder regularly for updates. Please see your counselor or career coach for assistance. Students if you received a letter from Mrs. Colorado, please come to the Upper Commons at dismissal for Math and Reading SOL Tutoring. We will have snack and your teacher will come pick you up. Testing will be on Thursday and Friday. Please see Mrs. Colorado in Room 600 if you have any questions. All students interested in wrestling this year please plan to attend a meeting at 2:45 on Thursday September 18th in the Wrestling Room. If you cannot attend, please see Coach Wortman in Room 114. Senior Portraits will be taken today outside the front office. Students should report there at they’re assigned times. Applications to join the Spanish Honor Society are due to Sra. Marzana by the end of the school day on Thursday, September 18th. Gracias. Attention seniors â senior portrait retakes will take place tomorrow from 8:00 am â 3:00 pm. The sign-up sheet will be located outside the media center. ASVAB Testing! Students interested in taking the ASVAB on Monday, October 27, please sign-up in the binder located on the Career Coach door, room 622. Senior portrait retakes will take place Wednesday, September 17th from 8:00 am â 3:00 pm. The sign-up sheet will be located just outside the media center. ASVAB Testing! Students interested in taking the ASVAB on Monday, October 27, 2014, please sign-up in the binder located on the Career Coach door, room 622. Love to play cards? Come join our new Bridge Club and learn to compete. No experience necessary! Come alone or bring friends â You will learn, play and have fun on Monday afternoons in room 409 starting at 2:30PM. There will be a very important meeting for all girls interested in playing softball this year immediately after school on Tuesday in the commons area. Our new coach will talk about pre-season workouts.